Tata, today, launched the cheaper Aria 4×2 in three variants: Pure, Pleasure and Prestige, priced at Rs. 11.61 lakh, Rs. 12.61 lakh and Rs. 14.26 lakh respectively. With this launch Tata says the Aria will now appeal to a much wider audience. And it’s about time too. It’s been about 9 months since the launch of the Tata Aria 4×4 last October, but this flagship crossover vehicle from Tata hasn’t been a hot-seller, selling only about 200 vehicles a month on average. One of the primary reasons was that it was perceived as being too expensive in 4×4 guise, as not many buyers were really looking for a 4×4 vehicle and willing to pay more for it. The 4×4 Aria is priced between Rs. 13.25 lakh to Rs. 15.84 lakh for three variants. By removing the on-demand Borg-Warner 4×4 system, reducing weight by using a non-Euro NCAP body using lighter steel bits and knocking off some other luxuries such as cruise control and satellite navigation, Tata has brought the price of the Aria down considerably. So what are the prospects of the Tata Aria 4×2? We give you some first impressions. The Tata Aria’s looks may not appeal to all, as they are a bit radical. The 4×2 sports no external differences to the 4×4 variant except for the badging (4×4 Adapterra) which is missing. The Pure (base) variant also does not have front fog lamps. Alloy wheels also come only on the Prestige variant while the Pure and Pleasure sport 16-inch steel wheels. In terms of fit and finish, the Aria 4×2 has better plastic quality compared to other Tata vehicles, but the fit on the interior plastics could be improved even further. 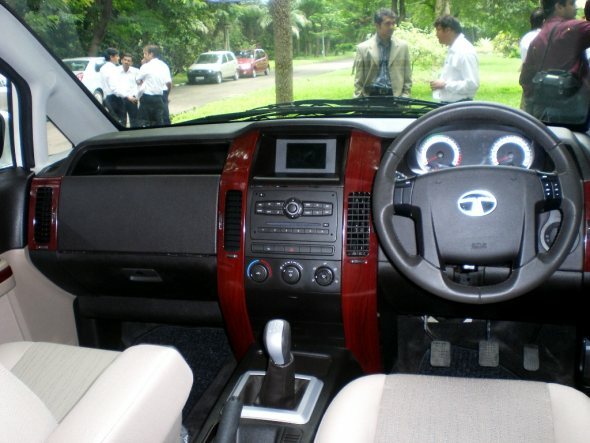 CarToq was invited by Tata Motors to Pune to review the Aria 4×2 ahead of launch. First impressions show that the Aria is a much more refined vehicle compared to the other Tata vehicles and NVH levels are at par with its main rival the Toyota Innova. In terms of handling, the Aria holds its poise at high speeds but there is some amount of body roll still present on corners. However, the use of all-round disc brakes and ABS on all variants does inspire confidence in stops, though the brake pedal feel is soft. The Aria is powered by a 2.2 litre common-rail diesel engine that puts out 138 bhp of power at 4000 rpm and 320 Nm of torque, driving the rear wheels through a 5-speed manual transmission. This puts the Aria ahead of the Innova in terms of pure power specs, as the Innova makes do with a 2.5 litre, 102 bhp engine only. We will bring you a detailed road test on the Aria shortly. After knocking off the 4×4 system and reducing the steel gauge on some panels, Tata has managed to reduce about 200 kgs of body weight. This makes the Aria 4×2 slightly more fuel efficient. It has an ARAI-certified mileage of 13.7 kmpl, which is slightly better than the Innova’s claimed mileage of 12.99 kmpl. All three variants of the Aria 4×2 come with ABS and disc brakes all around. The Pleasure and Prestige also get dual front airbags as standard. A CD, USB, Aux-in music system is also standard across the range, while the Prestige variant also gets Bluetooth and steering audio controls. One of the USPs of the Aria is the amount of storage space it offers. There are seven roof bins, and cubby holes all around. We counted nearly 33 in all. When compared to the Toyota Innova mid variant (the Innova GX), the Tata Aria seems pricey. The Innova GX is priced at Rs. 10.76 lakh ex-showroom Delhi. It comes with power windows, AC and power steering, but no other features. In comparison, the Aria Pure 4×2, priced at Rs. 11.61 lakh comes with ABS and all round disc brakes as standard, has a music system with six speakers, features electric mirrors and independent AC vents for all three rows. Compared to the top-end Innova VX priced at Rs. 12.61 lakh, the Aria Pleasure priced similarly has similar equipment to offer, while the Prestige variant adds a little more tech. The Aria also has marginally more interior space than the Innova, but a lot more power on tap. 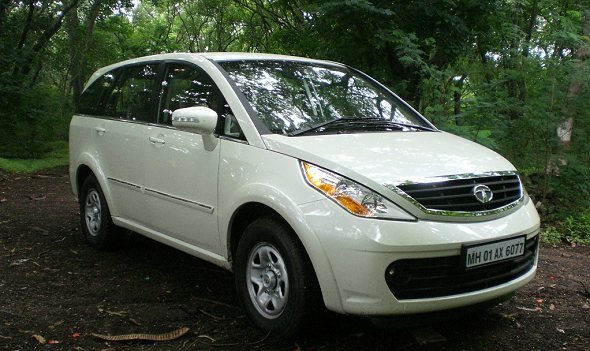 We think the Tata Aria 4×2 should have been launched months ago, when the 4×4 variant was launched. Tata was trying to use the Aria to showcase its technological prowess and had loaded the top-end Aria Pride with every conceivable gizmo, including equipment not seen in vehicles even pricier such as the Toyota Fortuner, Ford Endeavour or Honda CRV. But at Rs. 15.84 lakh for the top-end 4×4 Aria, customers did not see value in a 4×4 Aria. But now with a cheaper 4×2 variant becoming available, Tata hopes to appeal to a wider audience. It has all the equipment and muscle needed to take the fight to the Toyota Innova, but we think it’s going to be a tough battle. The Aria will probably appeal to those who find the Innova underpowered and are looking for a more powerful people-mover. « Honda City Video Review: It’s old but is it still gold?